The ‘Bulls continued their supremacy by taking a one-two in Japan on Sunday. New to the car for this weekend were slightly updated upper fins on the rear brake ducts, directing airflow inside of the rear tyre more efficiently to decrease drag as well as work the components (fins, duct “flick-ups”, edge of the diffuser) beneath to work better accordingly, producing more downforce, too. Vortices are induced when high pressure airflow wants to migrate to low pressure airflow and the two pressure zones collide. This is a normal characteristic of pressures in a fluid system and one that teams exploit when reducing vortices emitted from the rear wing. The bigger the pressure difference, the greater the vortex produced. In the case we are examining here, high pressure is on the oncoming airflow face of the two vanes, as demonstrated by this diagram. We have learnt that the oncoming airflow will have the tendency to navigate its way to the negative region behind the vanes. The vanes are obviously completely solid so it can’t pass straight through them. 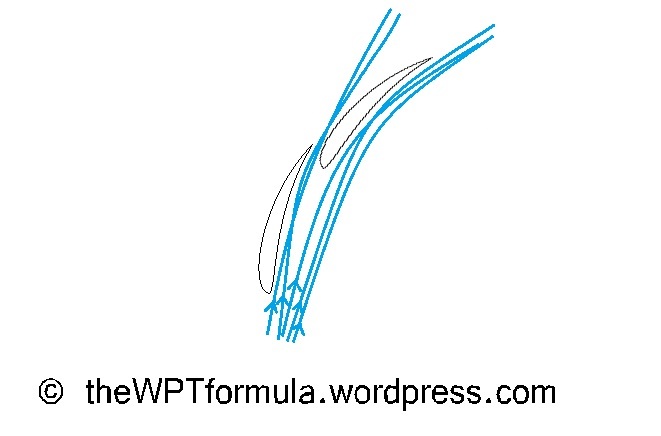 Nor can the airflow wrap right around the vanes as the oncoming airflow is too fast for this to happen, as shown below. However, at the top of the vane the oncoming, high pressure flow can creep over and in to the low pressure region the other side. As the pressure gradient suddenly changes, this can happen very quickly causing turbulent spirals of air to project along the top of the vane. In the diagram below we can see this effect taking place. For clarity purposes I have also included laminar flow travelling along the middle of the vane as explained above. There are two vanes on the Red Bull wing: the forward vane has very little Angle of Attack (AoA), whereas the back vane has quite an aggressive AoA. The back vane therefore has a greater pressure delta between the forward and rearward faces of the vane (think of it almost as a wind shelter on a beach) therefore more powerful vortices are produced as a result. 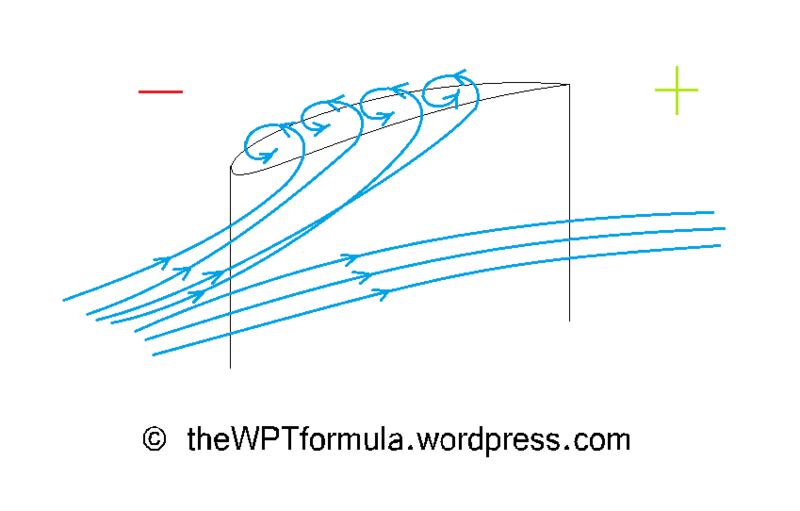 Both vanes create vortices along the top of the vane, passing them along their individual profiles before exiting at the trailing edge. Both vanes appear to have a trailing edge pointing in a similar direction. The two series’ of vortices produced must converge. They converge on the front face of the front tyre to try to breakdown the turbulence created by the rotating motion – tyre wake. Tyre wake causes drag and can impact on the aerodynamics immediately downstream of the front tyre (sidepods, bargeboards, floor). 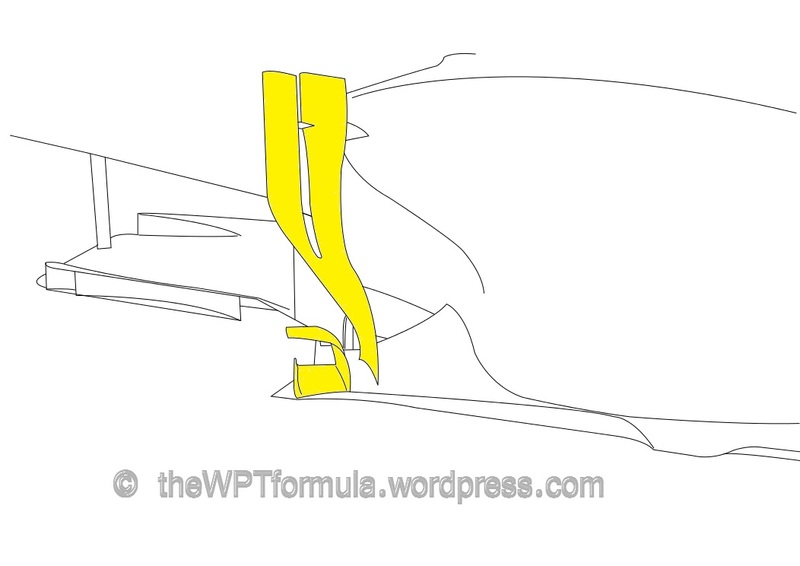 The two vanes are quite tall so their aim must be to break down tyre wake at the upper areas of the front tyre. This is a development they can carry into next year as the front wings will be narrower, therefore managing this tyre wake will be a bit more difficult. 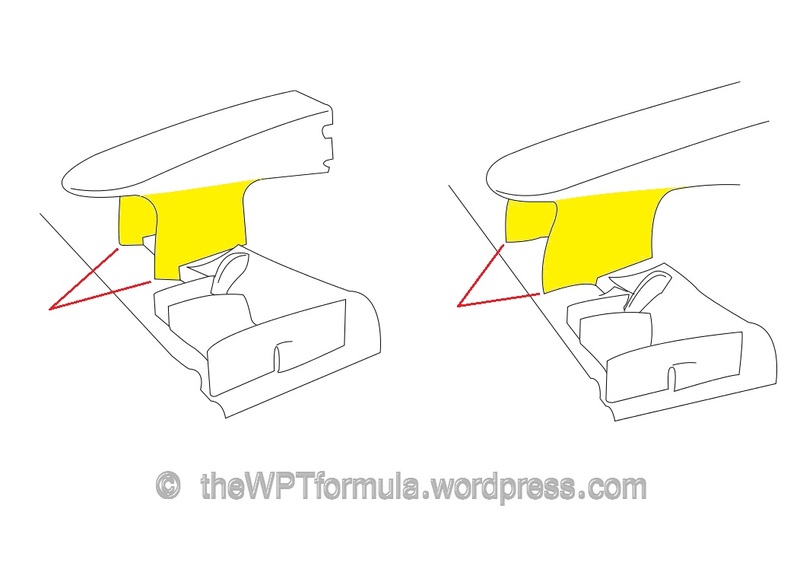 I would like to thank @F1_Aero (on Twitter) and Matt Somerfield (@SomersF1) for their help explaining this to me. Retained for this weekend, the Silver Arrows continued using a three-slot arrangement in front of the rear tyres. 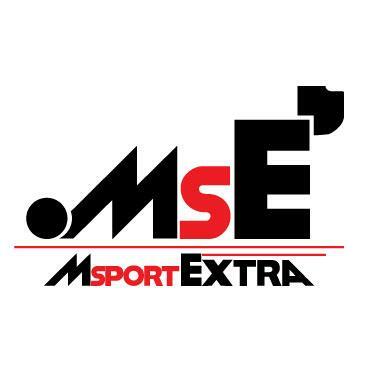 This replaces the single slot that has been used for the entire season and copies teams such as Ferrari and Red Bull. Their solution has always been an add-on section of the floor made out of titanium for reasons that I am not fully sure about. 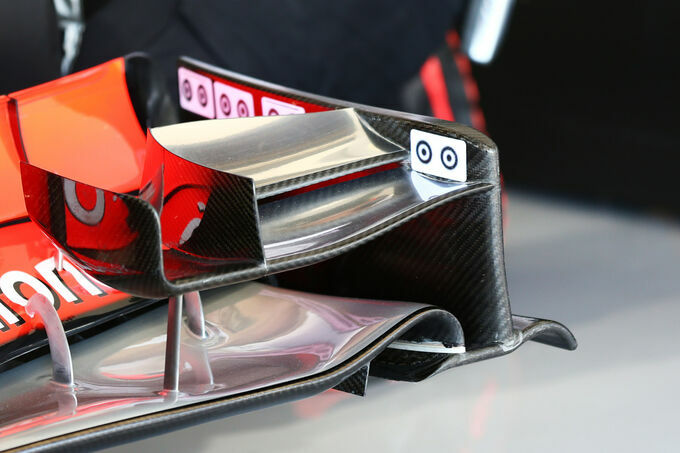 It may have something to do with how the friction of the air interacts with the slots made out of the metal element, as it has nothing to do with the heat from the exhaust gases that travel inboard of it on the other side of a carbon fibre fence. Jenson Button ran a slightly updated front wing on his MP4-28 in Korea last week and for Japan, Sergio Perez got his hands on one, too. The wing pillars are now attached to the very back of the wing, something that teams have been exploiting for a while whereas McLaren have not. This is beneficial as the elongated pillars are now even further back, aiding airflow to the T-Tray and bargeboard area and therefore having a positive impact on the diffuser at the back of the car. As a result, the wing is attached to much less of the pillar which can lead to a lot more flexibility. The team therefore decided to use these “target” stickers (see here – http://img3.auto-motor-und-sport.de/McLaren-Formel-1-GP-Japan-2013-fotoshowImage-fbfb7d0-727506.jpg) on the inside of the endplates to measure its movement by using a camera facing out from the pillar itself. 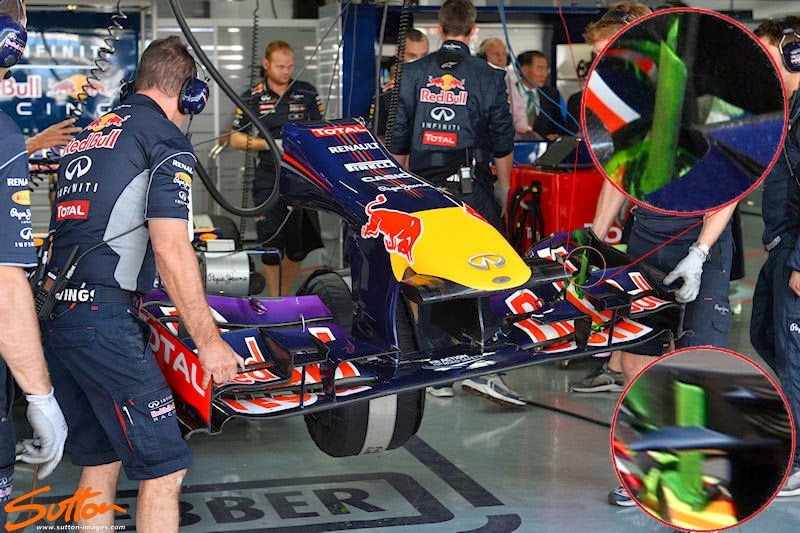 This is something that Red Bull have also done when testing a new front wing. The FIA have a deflection test to ensure that the front wings do not run too close to the ground so assessing the new wing was for legal purposes. They would have tested it on their own deflection rig back at their factory in Woking but on-track tests are, obviously, more realistic. McLaren then analysed the impact of the new pillars by placing a Pitot tube array in front of the sidepod area beside the bargeboard. Interestingly, McLaren have removed the second fence in front of each rear tyre that was introduced in Korea and have instead stuck to a sole fence aimed at directing the exhaust gases into the gap between the rear tyre and the wall of the diffuser. Possibly a James Allison influenced idea, an ‘r’ vane appeared on the F138 at the Korean GP last weekend, featuring again on the car in Japan. Allison’s previous employers, Lotus, adopted this type of vane as early as late 2011 and it has also appeared on the Sauber. The ‘r’ vane is just in front and beneath the sidepod airflow conditioner, that also received a small change at its base. Where previously there was a perforation, there is now a solid piece at the bottom creating just a single element design. This has been tapered more to hug closer to the sidepod. These changes, coupled with further refinements to the floor beneath, should help extract more downforce from the diffuser. 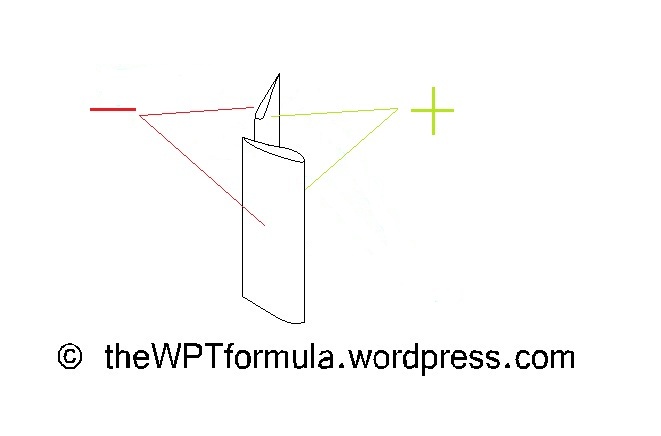 This entry was posted in 2013 Highlights, Technical Highlights and tagged 2013, f1, japan, Japanese gp, tech highlights, updates on October 13, 2013 by thewptformula.